Discussion in 'Online Games - News and Reviews' started by Marina, Oct 9, 2014.
of hieroglyphics to reach the highest winnings you can. Cleopatra is known for her beauty and ruling power like no other. She will sweep you away to reach the highest pyramid of winnings. the various software and I like it. I find it a good thing as players who are use to playing Novomatic slots will feel right at home playing the new software from Mazooma. playing at Stargames, is the no nonsense and not confusing game interface. They have taking Mazooma inspired slot games and incorporated them into the non-complicated casino interface. has in store for you. Trust me, the desert may become your oasis after a few spins on this one. will explode! Same as when you hit an incredible win. A big win screen will appear and the winnings will show right before your eyes. All wins pay left to right except the Scatter Book symbol. When you receive 3 or more Scatter Book Symbols, you will be sailing down the Nile river to incredible riches. the winning amount is multiplied from 2x to 8x. Raven, Dog's Head, Cobra, "pink onion" symbol, Scarab, Ace, King, Queen, Jack, Ten and Nine. 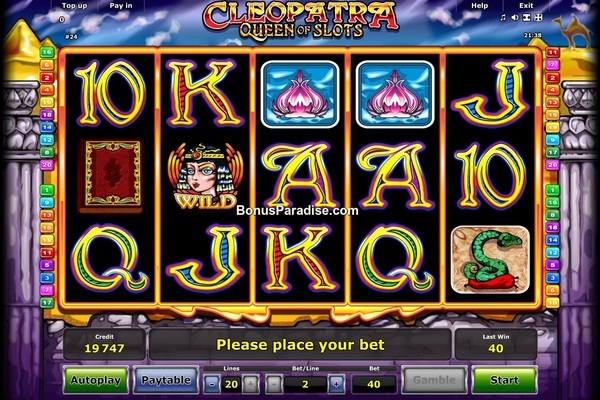 When the Wild symbol of Cleopatra appears in a winning payline, your win could be multiplied from 2x up to 10x. You could really increase your bank. From 3, 4 or 5 books, you'll be faced with a book to click to reveal the number of free spins. Pages will turn to reveal the amount of free spins. I always have a difficult time chosen which one. the pages of the book turn to reveal your extra Wild symbol. With this additional Wild symbol, you could win 10x's the payline amount and amass a bankroll like no other. Cleopatra will be winking at you for all your glorious winnings. The free spins could be won again when 3 or more of the Scatter Book symbols appear. Now that would make Cleopatra climb the highest pyramid there is. Whether or not you like the Egyptian themed slots, this is one great video slot to check out. It may seem like a slow payout at first, but once it starts hitting, it blows it out of the desert. I played Cleopatra yesterday at StarGames Casino. The game can pay very well. This is for me the first Mazooma slot I really like. I hope to see some more nice releases soon from Mazooma Games!